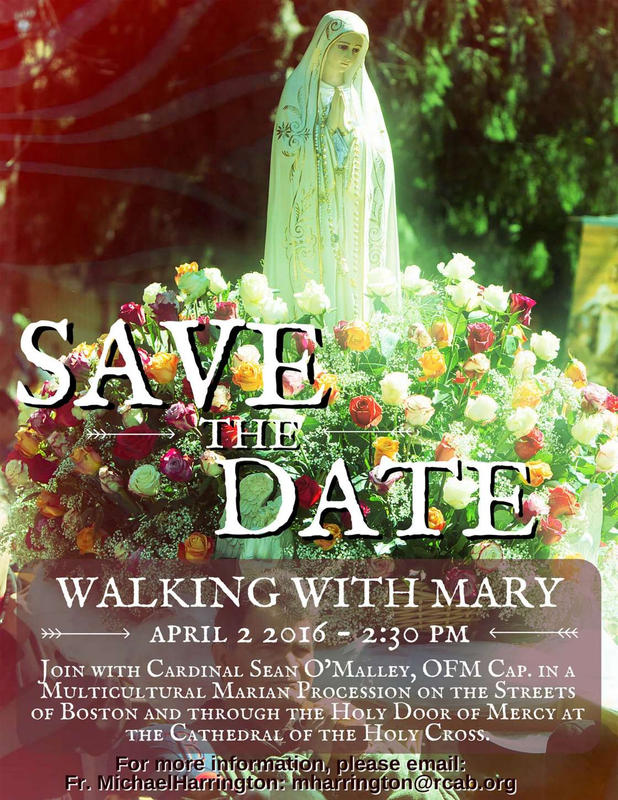 The Filipino Community have been invited to sing and join the procession at the Walk with Mary Event on April 2 (See details below). This is a Multicultural Event, so Fr. Harrington requested us to wear our native costume, Filipiniana and Barong. Please register HERE if you are coming to this event. Please eat hearty breakfast/lunch before the mass. BEFORE 12:00 NOON Registration for those who arrived early. 1:30 - 2:00 PM REGISTRATION continues for those who arrived late . LIGHT SNACKS (SANDWICHES) will be served. *There will be a short break between the two talks. 4:00 - 5:00 PM - passing THROUGH THE HOLY DOOR, confessions will be available during this time. We are inviting you to join our Rosary Rally to honor St. Joseph's Feast day and to pray for protection of our families. It will be this Saturday, March 19, 2016 at St. Joseph Church, Salem St, Malden. Assembly in the parking lot from 1-1:30. Rosary Rally starts at 1:30 pm. Please bring your friends and family. Have umbrellas and rain gear in case of rain but weather seems to be sunny this day. Please park at the backof the church. There will be confessions at 3 pm in the Church so we need to maintain silence at this time.